Maui Wowi recently appeared not once, not twice, but three times on Fox News. The network took an interest in the viral video featuring our location in Ocean City, New Jersey and played the video during their Shot of the Morning segment. Soon after it aired, the producer invited store owner Seth Bazacas to do an on-camera interview at their studios in New York. The segment went so well that they asked us back again to appear on Fox & Friends. Seth and his business partner Kyle Plachta were interviewed by Fox News reporters and the video was played for a third time on the network. An additional segment posted online called After the Show spent some extra time with Seth and Kyle explaining the tradition and what it means to them. Please check out the clip below and then visit our YouTube channel for more. 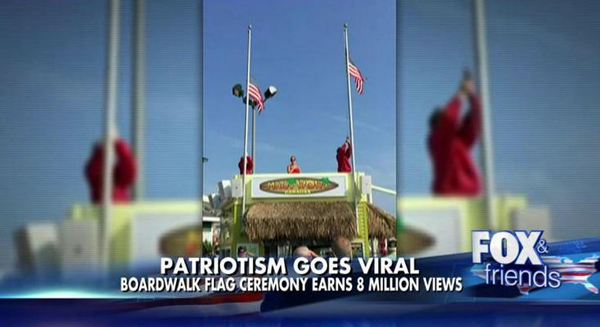 This entry was posted in Maui Wowi Posts and tagged america tribute, fox & Friends, fox news, Loud speaker, Maui Wowi, new jersey, Ocean City Boardwalk, Patriotism, raising of the flag, Seth Bazacas, Shot of the morning, star spangled banner, veterans, viral video. Bookmark the permalink. ← What Do Cookies and Franchising Have in Common?